In mid-June, Transportation Secretary Ray LaHood, on behalf of the Obama administration, offered a temporary finance plan that, if implemented, could put off legislation to overhaul federal highway and transportation programs. It would also delay a possible vote to raise the national gas tax past the 2010 congressional midterm elections. The proposal came just a day before Rep. Jim Oberstar (D., Minn), Chairman of the House Transportation and Infrastructure Committee, released an outline of the legislation – THE SURFACE TRANSPORTATION AUTHORIZATION ACT OF 2009 – aimed at reforming transportation nationally. The current transportation authorization law is set to expire at the end of September. While only an extension is supported by the Administration and the majority of the Senate, Rep. Oberstar’s bill is gaining moment from members of the House — Republicans and Democrats — and special interest groups, including the Chamber of Commerce. But, the new transportation legislation must be heard by the House Ways and Means Committee first — and Healthcare reform, not transportation, is their mandate for the moment. Still, the Minnesotan politician is not backing down. BLUEPRINT AMERICA: What needs to happen with the national transportation system? REP. JIM OBERSTAR: The end of the interstate era and the beginning of a new period of transit — to give people in America something more than where the road goes, but where the people (want) to go. We need to transform the entire Department of Transportation to make it work. BLUEPRINT AMERICA: How did America get to this point? REP. OBERSTAR: Let me tell you how it all started. In 1894, a group of bicyclists upset with the ruts being caused in their bicycle trails by the newfangled horseless carriages got 150,000 names on a continuous petition, wrapped it on one of those telephone cable devices, put it on a flatcar, hauled it to Washington, rolled the cable device to the U.S. capitol from Union Station, presented it to the Appropriations Committee and asked for $10,000 for a study of paved roadways for the horseless carriages. The Congress complied. The funds were appropriated. The study completed. It resulted in the establishment of the Bureau of Road Inquiry in the U.S. Department of Agriculture in 1896. A few years later, that became the Bureau of Public Roads. 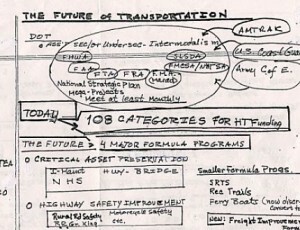 BLUEPRINT AMERICA: That was how it all started, why do we now have to transform the entire Department of Transportation to make the national transportation system work? BLUEPRINT AMERICA: Why was the system built this way — to favor highways over transit? REP. OBERSTAR: Funding is skewed away from transit and into highways because transit grew up in a different environment. It was a spin-off of railroads. It was during the 1960s, just before the creation of Amtrak. The railroads wanted to get rid of their passenger service. And they wanted to pass it off as a transit program. And secondly, transit was considered something to help the elderly and the disabled and the poor — it was a social program instead of a transportation program. For example, Los Angeles had one of the most extensive streetcar systems in the country. But, they tore up the tracks, put in highways, roadways, streets and paved to accommodate the car. We have suburbs because we have the car. We have exurbs because of the car. Now, we have to transform our thinking in America. BLUEPRINT AMERICA: But, who made this choice — the government or the people? REP. OBERSTAR: Those were conscious decisions by the American public who wanted the freedom, the mobility of the automobile to go where they wanted, to travel where they wanted and so roads were built to accommodate public interest. People made choices to move away from the public transportation system to a private, personalized transportation. And that resulted in sprawl. We have to now transform our thinking — to link land use and development to transportation. And not require transportation to go where the land use went. In an urban setting, a mile of freeway may cost in the range of $46 to $50 million. The same mile of urban light rail will cost $26 million and move twice as many people — or three times as many people. And that is what we need to impress. BLUEPRINT AMERICA: What then will your transportation bill change? REP. OBERSTAR: (This) has to be a transformational chapter in transportation — we need to restructure the way we deliver transportation. We have to take all these years of cumulative programs and adding to the responsibilities of states, and restructure it to transform the way transportation is delivered in America — to deliver projects faster and to assure that livability is high on the agenda. So, take the 108 categories through which Federal Highway Trust Fund dollars are funneled out to the states and condense those into four great program areas. And give the states responsibility to set objectives over a six-year period and interim six-year goals to achieve their long term objectives that are national as well as state objectives. And report annually on their progress and show how they are achieving those goals. And we’ll measure them on that performance. Also, we need to insist on intermodalism — to have an Assistant Secretary for Intermodalism who will bring together, at least once a month, all of the modal administrators: Aviation Administration, Highway Administration, the Federal Railroad Administration, the Transit Administration and the Federal Motor Carrier Safety Administration. Bring them all together and talk about safety, mobility, livability and how they can all work together for the benefit of this country. BLUEPRINT AMERICA: But, this will require an investment from the American people — an increase in taxes even while the country is in recession. How do you get public support? REP. OBERSTAR: In 1956 Congress enacted the National System of Interstate and Defense Highways with a three cent gas tax, or user fee as it was called. Three cents on a gasoline price of 30 cents. That was 10 percent of the cost of fuel. Passed the House readily. The following year it was clear that more funding was needed for the system. And the Bureau of Public Rolls proposed an additional penny. It passed the House on a voice vote. There was a sense of greater vision, of a greater need in America for safety, for mobility, to move people and goods and our economy more efficiently, more effectively. And the public understood that that penny was going for those roadway improvements. We need to rekindle that same spirit and understanding in America and show that an additional user fee will make life better. If we show the American public we are going to move goods more efficiently in the urban and interurban environment, we’re going to move people more efficiently — less congestion and a better road surface — they will understand. They will accept it. We have an intelligent public. We have to show them that this is going to be a better way to move goods and people in our society. BLUEPRINT AMERICA: The Obama Administration is not willing to raise the gas tax to fund your transportation bill — Transportation Secretary Ray LaHood has said as much. What do you do without the Administration’s support? REP. OBERSTAR: In the end, the Congress decides, not the Administration.